Synthetic peptide within Human Androgen Receptor aa 1-100 (N terminal). The exact sequence is proprietary. WB: T47-D, LnCaP and 22Rv1 cell lysates; Rat and mouse prostate lysates. IHC-P: Human prostate, prostatic adenocarcinoma, prostatic hyperplasia tissues; Rat and mouse testis tissues; Breast carcinoma and prostatic carcinoma T3 tissues. ICC/IF: MCF7 cells;EP156T-AR, 957E/hTERT-AR and LNCaP cells. Our Abpromise guarantee covers the use of ab133273 in the following tested applications. WB 1/2000. Predicted molecular weight: 98 kDa.Can be blocked with Androgen Receptor peptide (ab191380). IHC-P 1/500. Perform heat mediated antigen retrieval with citrate buffer pH 6 before commencing with IHC staining protocol. Immunocytochemistry/ Immunofluorescence - Anti-Androgen Receptor antibody [EPR1535(2)] (ab133273)Image from Azeem W et al., PLoS One. 2017;12(6):e0177861. Fig 6.; doi: 10.1371/journal.pone.0177861. Texas red (Tx-Red) indirect immunofluorescent detection of Androgen Receptor using ab133273 in (A) EP156T-AR, (B) 957E/hTERT-AR and (C) LNCaP cells. The cells were treated with ± 1 nM R1881 for 24 hours. Immunocytochemistry/ Immunofluorescence analysis of MCF7 (Human breast adenocarcinoma epithelial cell) cells labeling Androgen receptor with purified ab133273 at 1:100 dilution (1.3μg/ml). Cells were fixed in 4% Paraformaldehyde and permeabilized with 0.1% tritonX-100. Cells were counterstained with Ab195889 Anti-alpha Tubulin antibody [DM1A] - Microtubule Marker (Alexa Fluor® 594) 1:200 (2.5 μg/ml). ab150077 Goat anti rabbit IgG(Alexa Fluor® 488) was used as the secondary antibody at 1:1000 dilution. DAPI nuclear counterstain. PBS instead of the primary antibody was used as the secondary antibody only control. Lysates/proteins at 1/15 dilution per lane. The androgen receptor variant band detected in 22RV1 cells is reported by PMID: 22315407. We recommend you to try both RIPA and 1%SDS Hot lysis preparation methods to get desired bands. Immunohistochemistry (Formalin/PFA-fixed paraffin-embedded sections) analysis of rat testis tissue sections labeling Pumilio 1 with Purified ab133273 at 1:500 dilution (0.25 μg/ml). Heat mediated antigen retrieval was performed using ab93684 (Tris/EDTA buffer, pH 9.0). Tissue was counterstained with Hematoxylin. ImmunoHistoProbe one step HRP Polymer (ready to use) secondary antibody was used at 1:0 dilution. PBS instead of the primary antibody was used as the negative control. Immunohistochemistry (Formalin/PFA-fixed paraffin-embedded sections) analysis of mouse testis tissue sections labeling Pumilio 1 with Purified ab133273 at 1:500 dilution (0.25 μg/ml). Heat mediated antigen retrieval was performed using ab93684 (Tris/EDTA buffer, pH 9.0). Tissue was counterstained with Hematoxylin. ImmunoHistoProbe one step HRP Polymer (ready to use) secondary antibody was used at 1:0 dilution. PBS instead of the primary antibody was used as the negative control. Immunohistochemistry (Formalin/PFA-fixed paraffin-embedded sections) analysis of human prostatic hyperplasia tissue sections labeling Androgen Receptor with Purified ab133273 at 1:500 dilution (0.25 μg/ml). Heat mediated antigen retrieval was performed using ab93684 (Tris/EDTA buffer, pH 9.0). Tissue was counterstained with Hematoxylin. ImmunoHistoProbe one step HRP Polymer (ready to use) secondary antibody was used at 1:0 dilution. PBS instead of the primary antibody was used as the negative control. Immunohistochemical analysis of paraffin-embedded human prostate tissue labelling Androgen Receptor using unpurified ab133273, at1/100 dilution. Unpurified ab133273 showing positive staining in Breast carcinoma tissue. Unpurified ab133273 showing negative staining in Normal brain tissue. Unpurified ab133273 showing negative staining in Normal tonsil tissue. 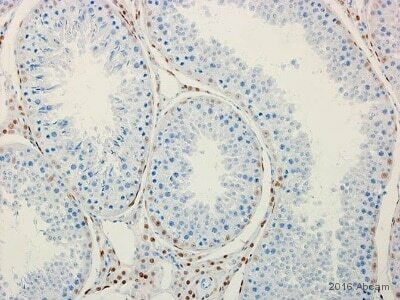 Unpurified ab133273 showing positive staining in Endometrial carcinoma tissue. Unpurified ab133273 showing negative staining in Normal breast tissue. Unpurified ab133273 showing negative staining in Normal colon tissue. Unpurified ab133273 showing negative staining in Ovarian carcinoma tissue. Unpurified ab133273 showing negative staining in Colonic adenocarcinoma tissue. Unpurified ab133273 showing negative staining in Normal liver tissue. Unpurified ab133273 showing positive staining in Prostatic carcinoma T3 tissue. Publishing research using ab133273? Please let us know so that we can cite the reference in this datasheet. I would like to use the antibodies against Androgen receptor for detection of androgen receptor in mouse brain floating tissue sections. Is you warranty covering also this application? On your website you mostly show images for prostate, which has much higher expression levels than the brain, so therefore, I would like to check whether your warranty also cover brain tissue for that specific antibody. Interestingly, though, some our colleagues did use antibody 1852-1 successfully (at least they showed photomicrographs) for detecting AR in mouse brain tissue. To our knowledge, ab133273 not been tested in IHC-FrFl (Immunohistochemistry - Free Floating). However by participating in our AbTrial program you can now use our products in an untested application or species without financial risk. I am unable to offer this for ab52615 since it has been tested un-suitable for ICC/IF , IHC-P or IP by our lab. I am planning to purchase 1852-1 antibodies against androgen receptor through Abcam Europe. I would like to use this antibody for immunohistochemistry on floating brain sections (murine), as one my colleague has already done. However, since on your website you claim that antibody 3165-1 is suitable for immunohistochemistry while 1852-1 is not (although my colleague has used it and it worked) I would like to ask you if it would be possible to get, together with purchased 1852-1 antibody, also a small sample of 3165-1 antibody so I can compare the two which one might be better for our particular application? I can confirm that in our hands ab52615 (1852-1) is not working in IHC, ICC and IP. Therefore this antibody is not covered by our guarantee since we are not convinced that ab52615 is suitable for these applications. I can strongly recommend to use ab133273 (3165-1) for your IHC-P experiments. This antibody has been tested to work and we therefore can guarantee this for you. https://www.abcam.com/index.html?datasheet=133273 (or use the following: https://www.abcam.com/index.html?datasheet=133273). I am sorry to confirm that because we carry over 90,000 products, it isn't feasible for us to keep small sample sizes of our products. I hope this information is helpful. Please do not hesitate to contact us again with any further questions.